a serious option for treating diseases associated with muscle atrophy (motor neurone disease, sarcopenia). The leaves of the Japanese loquat tree (eriobotrya japonica) contain precious substances called oleanolic acid, amygdalin and, in particular, ursolic acid, a pentacyclic triterpene, small amounts of which are also found in rosemary, apple peel, holy basil (tulsi) and sage. Ursolic acid and its isomer, oleanic acid, are chemically almost identical, their structure differing only in the position of a methyl group (CH3). Both offer potentially important health benefits, such as preventing the development of cancer, inhibiting existing tumour cells, protecting against the side-effects of chemotherapy and radiotherapy, and exerting anti-inflammatory, antioxidant and antiviral effects. This supplement has been developed to offer the benefits of ursolic acid, a natural molecule found in the leaves of the Japanese loquat tree (Eriobotrya japonica). One of a number of active principles present in these leaves, ursolic acid has attracted scientific interest because of its anabolic effects. It has demonstrated several benefits for developing muscle mass and reducing fat mass. Several studies have demonstrated the anabolic properties of ursolic acid. Using a range of tests, scientists have shown that this molecule promotes the growth of skeletal muscle, one of the body’s major muscle types; indeed, there are more than 600 skeletal muscles throughout the body. Current scientific data suggests that ursolic acid stimulates muscle development by acting on two specific hormones: insulin and IGF-1. This action not only increases muscle volume and strength, but also reduces body fat, fasting glucose, and lipid levels. As part of a slimming regime, this natural active principle also appears to maintain muscle mass. Suffice to say that ursolic acid offers multiple benefits for those seeking a trimmer, more sculpted figure. As a result of its anabolic effects, ursolic acid is being seriously considered as part of treatment for certain muscular disorders. Scientists are particularly interested in ursolic acid supplementation for treating the muscle atrophy that occurs in sarcopenia and amyotrophic lateral sclerosis (ALS), also known as motor neurone disease. Other of this molecule’s therapeutic virtues are also being investigated. 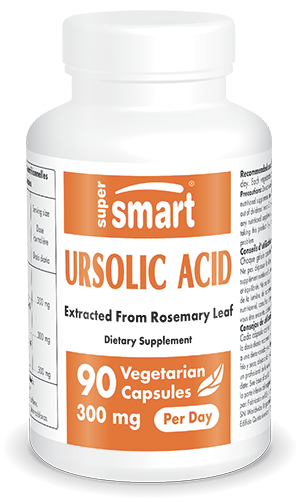 Studies suggest that ursolic acid has anti-inflammatory, antioxidant, anti-infection and immune-stimulant activity. It may also offer a number of health-protective effects, with research indicating that it helps fight infections such as the herpes virus, certain ‘flu viruses, and Koch’s bacillus which causes TB. According to other scientific data, ursolic acid may also reduce the spread of cancer cells. Additional studies are underway to evaluate and confirm the range of this molecule’s therapeutic benefits. Ursolic acid supplements are particularly popular with sportspeople looking to gain muscle mass and obtain well-defined muscles. Others value it for its ability to stem the loss of muscle tone associated with ageing. Our high-quality supplement is formulated using an extract of Japanese loquat leaf, standardised to 25% ursolic acid. Each capsule contains 200mg of this extract which provides 50mg of ursolic acid per capsule. The suggested dose for this supplement is three to six capsules a day, depending on individual need. Those wishing to achieve a more sculpted figure may also be interested in Crominex 3+ for improving muscle mass/fat mass ratio. For muscle weakness, molecules with anti-ageing effects, such as nicotinamide riboside, are also available as nutritional supplements. Adults. Take 3 to 6 vegetarian capsules a day. Each vegetarian capsule contains 50 mg of ursolic acid.